Tips and tricks for Magic the Gathering players. Be prepared! This is going to be one of the more complicated concepts to learn (as far as basic Magic rules go) but I'm going to try my best to simplify this without making you fall asleep. Today's topics are the Stack and Priority (the dynamic duo that fights off the terrible villain known as confusion). Both of these go hand in hand and many newer Magic players probably don't have a lot of experience with these terms so let's start slowly here (I'll be gentle). The Stack is a wonderful thing that keeps the game in order for us. The easiest way to remember it is: Last one in is the first one out (Some prefer the acronym LIFO = last in first out). What does that mean exactly? Well, everyone loves examples so here's a pretty common one: You play a spell such as Spore Frog (I shall name him Timothy.) but your opponent then plays a Counterspell (Timmy NO!). They played Counterspell last, so it's the first to happen on the stack which is why your spell is now countered (*sniff* I never got the chance to say goodbye... or hello for that matter.). Whenever something is cast, that player must give their opponent the chance to respond. If they were to wait for your Spore Frog to resolve then it would no longer be on the stack and they wouldn't be able to respond to it. If you're in need of visual aid then just imagine a stack of plates. You put your plate on top and have to leave it there before you can come back and pick it up. Your opponent gets a chance to put their plate on top of yours. You can't pick up your plate if their plate is on top so you can either lay another plate or leave things alone so that you can both pick up your plates one at a time. 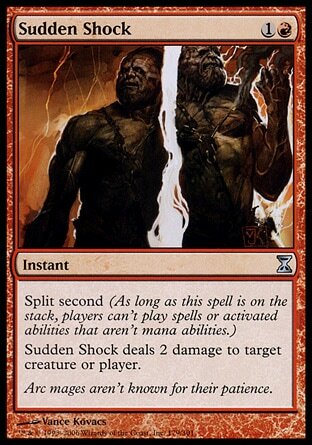 Anything that works at instant speed (Instants, cards with Flash, most activated abilities, and some triggered abilities). 1) You can't respond to the game itself such as the steps of a turn or a player playing a land. 2) You can't respond to mana abilities since they don't use the stack. 3) You can't respond to the announcement of a spell or your opponent attempting to pay the spell's costs. You can respond to the spell but that's it. You can't step into the ring until it's already cast. For example, you can't see that your opponent is tapping lands to cast something and then use a spell to tap out his lands to prevent him from doing that. Let's end the discussion of the Stack with a more complicated example. Let's say you have a Cunning Sparkmage and your opponent has a Gideon's Lawkeeper. They use the Lawkeeper's ability to tap your Sparkmage. In response, you can use your Sparkmage's ability to tap and deal one damage to the Lawkeeper (effectively killing it). Priority essentially works with the Stack (much like how Robin essentially works with Batman) but it only comes up during one circumstance: when both players want to do something at the same time. Example time: You cast Jace, the Mind Sculptor. You want to activate one of his abilities and your opponent wants to cast Lightning Bolt to take out your Jace before you can. You may be surprised to find out that Jace actually lives in this scenario. The key here is: if it's your turn, you have priority first. Thanks to this, you can use Jace's +2 ability which will knock his Loyalty to 5. You pass priority and give it to your opponent where they will cast Lightning Bolt but only be able to bring Jace down to 2 Loyalty rather than outright killing him. Magic Myth: that an Instant can be cast anytime that you want. That would be false. That may be the easiest way of teaching a new player the difference between an Instant and a Sorcery but the truth of the matter is: Instants can only be played when you have priority. This is Kylak signing out and getting the guest list ready for Timothy's funeral. VG Talk #11 Is F2P the W2G for MMOs?